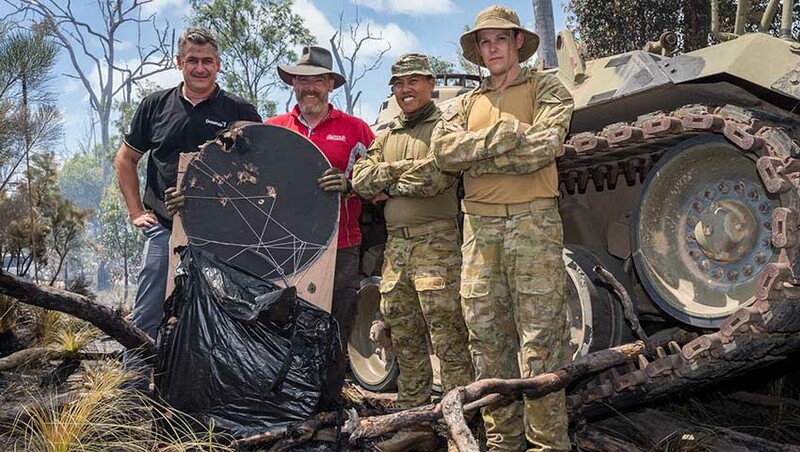 The Australian Army has successfully engaged practice targets for the first time with the SMArt155 munitions in an operational training environment, thanks to Australian advanced manufacturer REDARC Electronics’ Thermal Signature Enhancement Kit (RTSEK). The Royal Regiment of Australian Artillery has been progressively introducing new precision guided munitions (PGM) into service for the past 10 years. The PGM known as the SMArt155 (anti-armour modular artillery projectile) uses complex infra-red and radar sensors to target operational armoured vehicles and discount non-operational vehicles. Until now, no nation using SMArt155 has been able to fire them under an operational training environment because the ability to establish realistic thermal vehicle signatures has required complex high-voltage heat mats and large generators. Major Tony Mumford, SO2 Joint Fires at Army Headquarters explained that he had identified a number of lines of operation to bring SMArt into service: "One of those lines of operation was targetry. We were able to source three leopard tanks and two armoured recovery vehicles from the range, but we needed to find a solution to simulate a live tank for the munition to target and engage." In March 2019, during Exercise Chimera in Shoalwater Bay, the Army successfully engaged practice targets with the SMArt155 munitions in an operational training environment using the RTSEK. This was made possible because of a strategic and collaborative partnership between Australian SMEs – REDARC Electronics, Form Cut and IntelliParticle – to deliver an innovative solution to the Australian Defence Force within an extremely compressed time frame. REDARC’s specialist power management solution with custom insulation and packaging by Form Cut, and advanced carbon formulation by IntelliParticle, make the RTSEK an effective, low-powered thermal signature that allows Defence to train with advanced smart munitions. Defence account manager for REDARC Mike Hartas was pleased with the results that the team, in partnership with the Army, was able to deliver. "The ability of the Army to recognise that an Australian business was capable of providing such an advanced solution, in such a short time, speaks volumes of the growth local SMEs have undergone preparing to support the Australian Defence Force," Hartas explained. The RTSEK is an innovative solution to ensure that guided weapon sensors can distinguish target vehicles as being operational, without complex infrastructure. In some cases, the RTSEK will eliminate the need for complex high voltage heat mats and large generators that thermal vehicle signatures have historically required. Hartas added, "Being able to collaborate with other SMEs and offer an innovative and value for money solution to the ADF allowed us to focus the team and we can’t wait to be able to see what is next for RTSEK." REDARC is an advanced electronics manufacturer who can offer advanced solutions to Defence and defence industry thanks to their ability to collaborate with other businesses and work with customers to ensure their needs are met.